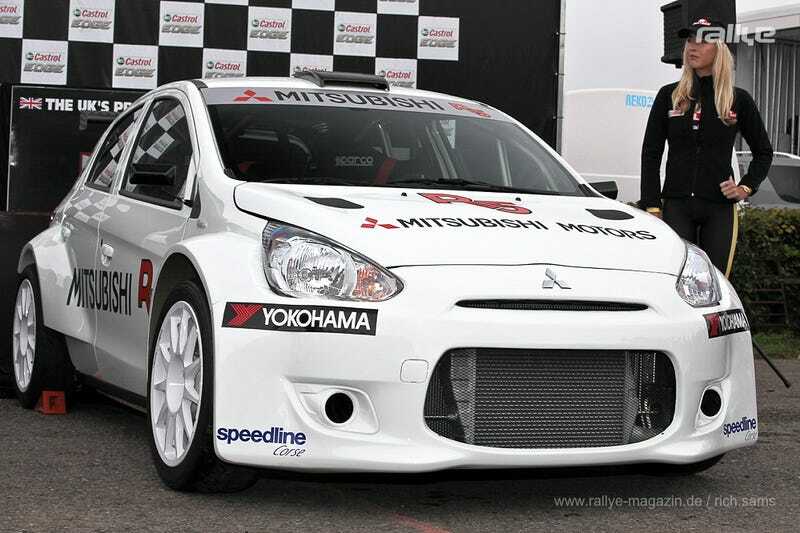 Is this Mitsubishi's slow and undercover return to WRC? WRX vs. Evo. The battle that is now been fought out in Internet forums, Facebook comments and Youtube videos once took place in the manliest motoring world championship, the WRC. Since 2008, both brands have abandoned the championship. While Subaru has hinted a LMP1 entry recently, Mitsubishi has been awfully quiet about their sporting ambitions. But now there's this: the Mirage R5, freshly unveiled in Sweden. Why Sweden? Well, that's where the bad news start. It's a privately developed car, built to the well received new rules applying for the second highest rally category. The people behind it are the guys from Ralliart Sweden, so they should know a thing or two about fast rally cars. Like all cars of that category, it's powered by a 1.6l 4 banger producing about 280hp. Will it be able to compete against the establishment of Ford, Citroen, Peugeot, Skoda and probably Opel? Who knows, but Ralliart claims that preorders are in the double-digit range.